Cooling tower is a peripheral equipment that removes heat from the hot water that is pumped from the condenser to the tower. It is done by using the air from the surrounding to reduce the temperature of the water. The air can be natural or forced by the use of fan. The capacity to cool the water depends on the evaporation of the water when air comes in contact with the water. This depends on the humidity of the surrounding air. Usually the tower should be able to cool the water by about 6°F to 7°F of the air wet bulb temperature. For example, if the wet bulb temperature of the air is 78°F and the hot water coming to the tower from the condenser is 95°F, then the cooled water that leaves the tower can be 85°F, about 7°F lower than the air wet bulb temperature. An example of the application is the use of this equipment to cool the water-cooled condenser from a chiller system. The hot water from the chiller condenser which could be located in the building is piped to the cooling tower. Pumps are used to circulate the water from the condenser to the tower and back. The hot water is sprayed through nozzle onto the thin films materials (also known as fill) which can be made of plastic, wood slats or metal fins. Their surfaces can be in the shape of honeycomb, corrugated sheet or flat sheet. As the water flows through these materials, air from the surrounding which can be natural-draft or forced-draft rushed through it and in the process evaporates some of it. This cools the water which is then collected at the lower sump and through a filter to get rid of leaves and other materials before being circulated back to the condenser. A drain is used to remove the hard water minerals from the system. As the amount of water will reduce due to evaporation and draining, a float valve is used to add the water to the system. The tower should be located in an area where the ventilation is good and not located too close to the building. This is critical for the natural-draft tower where the cooling is done naturally. Study also showed that Legionella bacteria could grow in the cooling tower water. Hence, it is also important to add disinfectants such as chloride compounds into the water. The level is maintained regularly and testing of the bacteria is to be carried out in instances where the spread of Legionnaire disease is rampant. These days, the materials that are used to construct the equipment are made of galvanized or stainless steel for easy maintenance. Non-metallic tower tends to degrade over time especially in polluted and harsh environment. Even the components inside the tower such as fan blades are also being constructed using fiberglass reinforced polyester or FRP. Epoxy is also used to coat them for protection from the ultra violet rays. A condenser which is located inside a cooling tower where it is cooled is also known as an evaporative condenser. 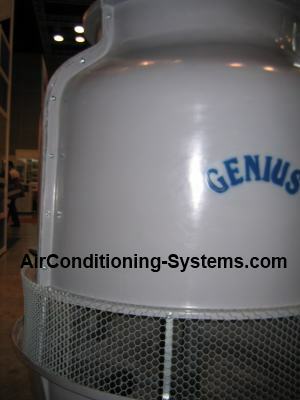 In this case, the refrigerant in the condenser is directly cooled by the water in the tower. The same process happen in that the water from the tower is pumped and recirculated. The water is discharged from the nozzle at the top of the tower and is allowed to drip on the coil of the condenser. This caused the hot refrigerant to cool and some portion of the water to evaporate. A fan is used to force the air through the coil where the water is being dripped. A float valve is used to replace the water that has evaporated as a result of them dripping over the hot coil. A drain is used to drain out the concentrated minerals from the water system. Anti-freeze chemical is also used to prevent the freezing of the water. Chloride based compound is also added to prevent the spread of Legionnaire disease.